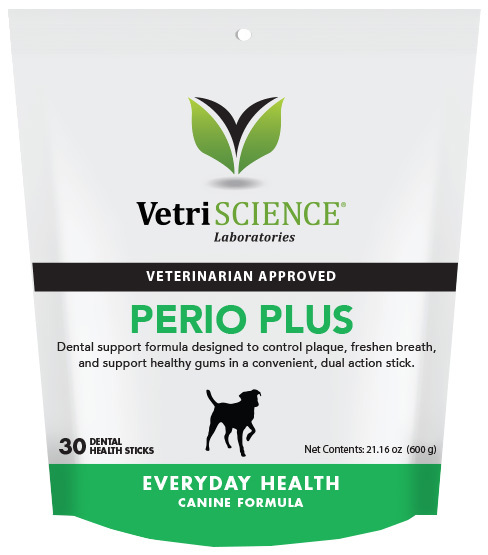 is a tasty, convenient, easy-to-use dental formula designed to support periodontal health. Designed to encourage an "in-between-the-paws" grip, the delivery system helps keep your pet's mouth healthy as part of a daily periodontal care program. According to the American Veterinary Dental Society, 80-85 percent of all pets have periodontal disease. That number jumps to 100 percent in pets over 4 years of age. In fact, it is the number one health problem diagnosed in dogs and cats. Dental health is important to the overall health of your pet because it affects the health of the heart, lungs and kidneys, which is why it is important to provide your pet with proper daily dental care before there is a problem. Outer layer that promotes dental cleansing, plaque control and fresh breath. Inner layer supports oral health including gum tissue integrity and refreshes the breath. 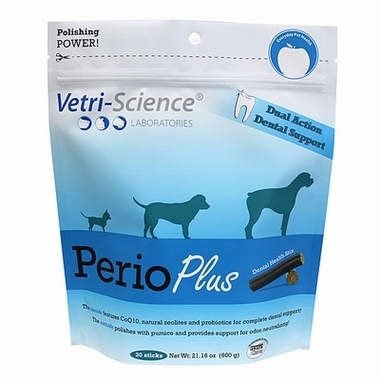 • Pumice (outer layer) is a natural abrasive that reduces plaque and bacteria that can lead to doggy breath. • Natural Zeolites (inner layer) are unique minerals that help prevent plaque from forming and sticking to teeth. • Zinc (inner layer) penetrates plaque on the teeth and oxidizes it, resulting in less plaque formation. • CoEnzyme Q10 (inner layer) is an essential catalyst for the creation of energy at the cellular level to support gum tissue function. Tissue levels of coenzyme Q10 decrease as pets age. Deficiencies of CoEnzyme Q10 have been associated with improper functioning of the heart muscle and gum tissue. • Cranberry (inner layer) is a source of antioxidants rich in bioflavonoids that support gum tissue health. They also help interfere with bacteria that can lead to plaque build-up and tissue destruction. • Taurine (inner layer) works with zinc to support gum tissue health and strength. Strong gum tissue is important because bacteria grows on dead tissue. Probiotics (inner layer) (friendly bacteria) help support bacterial balance in the mouth. They help the body displace unhealthy plaque-causing bacteria to support healthy gums and fresh breath. • Yucca Shidigera Extract (outer layer) is an herb that helps inhibit enzymes that break down the structural integrity of gum tissue. • Champignon Mushroom Extract (Champex™ brand) (outer layer) has been extensively studies for its ability to suppress odor-causing chemicals in the intestines stopping foul breath at the source. • Cinnamon (outer layer) supports a healthy bacterial balance in the mouth. • Spirulina and Parsley (outer layer) are great sources of the deodorizing and cleansing Chlorophyll. Give 2 sticks daily for dogs over 50 lbs.